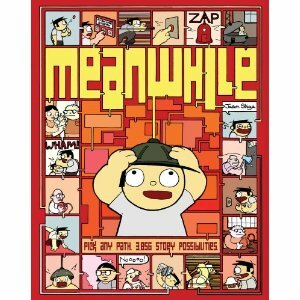 March 6 — Artist Jason Shiga will sign copies of his new book “Meanwhile: Pick any Path” from 5 to 7 p.m. at Giant Robot San Francisco, 618 Schrader St., San Francisco CA 94117; (415) 876-4773. Shiga, winner of an Eisner Award in 2003, will discuss the creation of his book and show sketches. “Meanwhile” begins as our young hero in dire need of a bathroom, knocks on the door of a mysterious recluse. His mansion is in fact a wonderous laboratory filled with amazing inventions: A mind reading helmet, a doomsday device and a time travel machine (although it can only go back ten minutes). For more infomation, visit www.shigabooks.com or www.gr-sf.com.